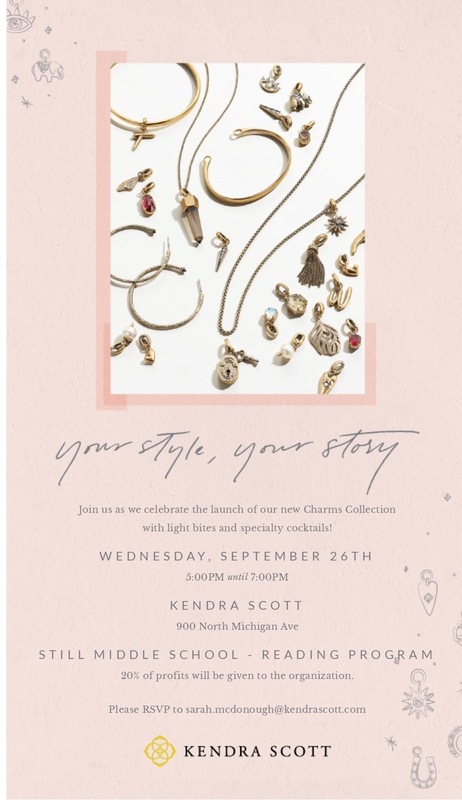 Join me on Wednesday, September 26th, for a reading fundraiser at Kendra Scott at 900 N. Michigan Avenue from 5-7P.M.! I’m so honored to be partnering up with Kendra Scott for my second year in a row to promote reading at my school. One reason I became a Reading Specialist was that when I was a Language Arts teacher, I had students struggle because they didn’t have reading skills. Reading is so important! This is also my 13th year in education and I love sharing my joy of reading with my students. This fundraiser will help grow our reading program and get new high interest books. I also love how my teaching/reading world and my blogging/fashion worlds come together for great causes – especially for READING! The new charms are also launching on the 26th and I got a preview of them and they are sooo cute!!! It’s going to be a fun evening! I hope to see familiar and new faces there! If you aren’t able to attend the in-store event and want to make a purchase benefiting my school’s reading program, you can phone in an order at (312)281.6760. Wish I could have been there! Hope the fundraiser was a success! Reading is essential. Students need to be able to comprehend various texts, make inferences, make connections text to self or text to text (just to name a few skills). Keep doing what you are doing! !